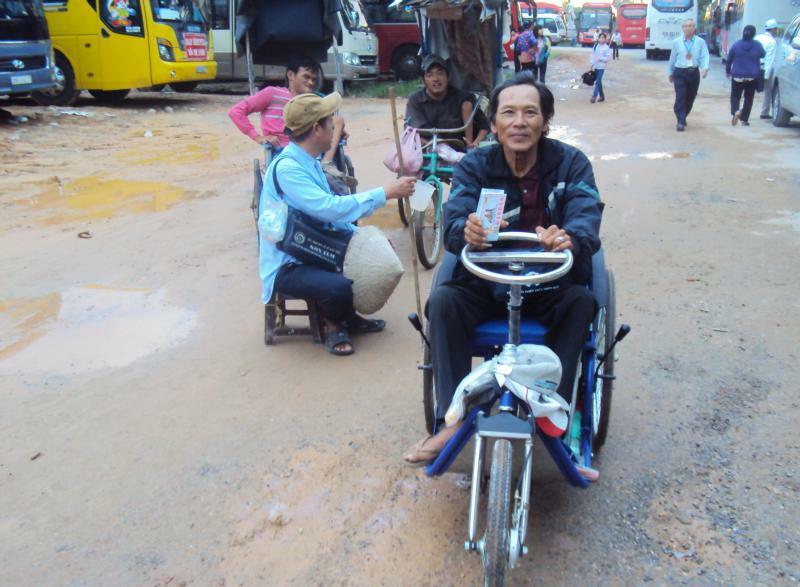 HUE, Vietnam (CNS) — Nguyen Thi Rot, a 16-year-old woman paralyzed from birth, tries to smile sweetly at those who stop by her wheelchair on a Hue City sidewalk to buy lottery tickets. Until earlier this year, she was confined to her bed, unable to move or get outside without assistance. Now she helps support herself and her mother. Her mother, Le Thi Re, 54, says that, in the past, she spent all her time looking after Rot, who was confined to her bed all day long. Only rarely could Re manage to carry her daughter on her back to go outside. Re says the wheelchair cost 10 million dong ($430), which she could not afford. Rot was one of 30 people without use of their limbs who were given wheelchairs last June. The chairs were presented to them at Kim Long Charity Clinic, run by the Daughters of Mary Immaculate sisters since 1992. Sister Mary Vu Thi Ngoc, who has offered Rot basic supplies since 2016, says disabled people like Rot find it hard to integrate themselves into communities, because they cannot go out to communicate their ideas and feelings to other people. Most of them live on their relatives’ support. Sister Ngoc, head of the congregation’s charity committee, says the nuns try to help them deal with their problems and make a living on their own. Since 2016, the sisters have asked benefactors abroad to give wheelchairs to 150 disabled people. Thua Thien-Hue province, where fierce fighting occurred between American troops and communist guerrillas during the Vietnam War, is home to more than 30,000 people with physical disabilities, according to provincial data. They include those who are maimed by unexploded ordnance left from the war, wounded soldiers, and people who are born with deformities, have been in accidents or suffer from disease. Nguyen Ket, 71, says he lost his legs in 1985 after hoeing in a field and triggering a landmine covered by soil. He says he became a burden to his wife and children, who work on a farm to support him. Ket says that after receiving a wheelchair from the nuns last year, he can earn 50,000-80,000 dong ($2.15-3.45) per day as a lottery ticket seller. “I also use the vehicle to attend wedding parties, funerals, public events and visit relatives,” he says with a broad smile. Nguyen Van Vu says his left leg was amputated due to diabetes in 2013. “I was given a wheelchair by the nuns in 2016, and I use it to sell lottery tickets at bus stations and markets for a living,” says the 57-year-old father of three. His family has improved its material life, he says, building a new house and paying off debts with 400 kilograms of rice. Ngoc says the nuns also provide bicycles to children from impoverished families, some with disabled relatives, in remote areas. The bikes offer the children a way to get to school. Pham is a correspondent for National Catholic Reporter and Global Sisters Report, based in Vietnam.